You probably remember the « Race Against The Machine » published by Andrew McAfee and Erik Brynjolsson last year and its relatively doom-saying approach to the fact that technologies were killing jobs faster than they were creating new ones. It was a short book, rather a pamphlet. This one is bigger and comes back to most of the arguments, puts more data around them, and most importantly, is slightly more optimistic on the job creation potential. I would advise you to read it. 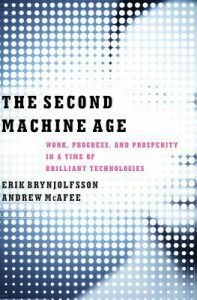 I will not make a summary or a review here because many have already be published, see for example https://www.goodreads.com/book/show/17986396-the-second-machine-age, but I will only add a few personal comments that may add to your reading experience. Computer can’t replace humans everywhere but on the disappearance of jobs the authors show a major other paradox: those jobs not replaceable by computers are often poorly paid, from nurses to cleaners to teachers to cooks gardeners and even doctors etc. Optimism is not over joyful here. Yes, automation and digitalization will go on killing jobs, and the moment they will create more new jobs than the ones they destroy is not visible yet. However this book, and our own work, let us believe that it could appear rather sooner than later. Besides the power of machines, in my view, the authors still underestimate the power of collaboration as another significant source of jobs displacement. Collaboration, and particularly in its social form, is de facto a sort of real life immense brain connecting people and machines in such ways that jobs, for instance as paid encyclopedia contributors, have disappeared. The concern with collaboration is that it always reduces transaction costs. Wherever a transaction/interaction was earlier made by requiring human work, jobs are destroyed the moment the transaction is done without human intervention,. Most middle managers fear today the development of internal corporate social networks. They know that an important part of their work was to be a transaction/interaction intermediary. Corporate social networks will kill a lot of middle manager’s tasks (and the question is will they be able to reinvent themselves in more productive set of tasks?). The number of opportunities to create new jobs might well be equivalent or much bigger than the threats to destroy jobs, because reduced transaction costs increase the number of « possible futures » by an enormous amount, but we haven’t seen it enough yet. The authors’ point on matching (from rooms to cars to anything that can be shared) is a perfect example of the job creation potential. Better matching is already the proof that thanks to technologies we can invent transactions where the markets were very imperfect and we can improve all of them drastically. However I think the authors don’t go far enough on the impact of a sharing economy. The externalities are so complex to grab that a model would be really welcome. In short a free sharing economy like Wikipedia destroys jobs (encyclopedia employees and encyclopedia articles writers but also many information specialists jobs in most firms and organizations of the world) BUT it simultaneously allows many to access knowledge and to build ideas on it. Gutenberg destroyed the jobs of Bible writing monks but created probably over history billions of new jobs… Amazon mechanical Turk creates a lot of jobs because for most of the small jobs performed they just could not exist before the arrival of a proper matching system. AirBnB or Uber may actually destroy jobs because they are parasitizing (i.e. piggybacking on) industries where regulations have become too costly for the incumbent. They also create an efficient market where it was obscure, and therefore create a lot of positive externalities. For example, many more people can now afford to travel, they will go to restaurants, museums, etc. thereby creating more jobs even if the primary effect of AirBnB might be to harm those working in hotels. My guess is that in the end market efficiency will bring a positive impact but I have difficulties to understand the magnitudes and the arrangement of externalities. The addition of the exponential reach of many technologies AND the combination of them will play the next chapter of history. Surprisingly there has been only very few ground breaking innovation within the last few years. What we talk about as disruptive technologies, from 3D printing to Big Data to self driven cars to collaboration economy, etc. are « old » ideas having floated in the air for the last 20 years at least BUT finally coming together now and at an exponential speed. The revolution will be in the combination and all the services it can bring. I hope the authors will soon write a new book on the recommendations because this one is a bit frustrating. A number of proposals they bring are great but imply, as they are, huge paradigm shifts in our ways to manage economy, corporation, education, health, start up revival, etc. Either we believe in Big Bangs in policies or we find ways to invent small steps and encourage them to multiply. Big Bangs are too brutal to be acceptable, small steps are too small to have a fast enough impact. An interesting track in my view would be to see how humanity could ride the train of catastrophes. Let me explain: Fukushima is actually helping enormously to accelerate the thinking on nuclear energy; similarly NSA’ PRISM scandal helps to advance much faster on data privacy issues. Those catastrophes, and we will have many more, are potential game changers in the mind of citizens, policy makers and executives. And to come back to our center of interest: one of the biggest messages for management is that all managers, employees, corporate and political leaders will have to work WITH the machine rather than to even think they could win a race AGAINST the machine.